New book out? Yes. Excited? Yes. 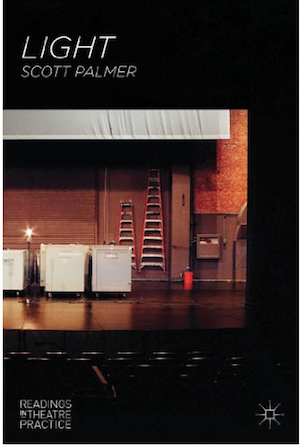 On Stage Lighting takes a look at the newly published Light: Readings in Theatre Practice by Scott Palmer and wonders where such a book has been all our lives…. The arrival of a new book in the stage lighting world is always a bit of a red letter day for those of us keen on the subject. The early 21st century has seen growth of interest in lighting and increase of educational provision to meet the demand. Light in performance is a lot more, like, all up in everyone’s grill due big ol’ festies and the high profile TV shenanigans of things like Britain’s Got Dance on My Ice-Factor. In the past, anyone interested in lighting had to make do with a well thumbed book by Mr Bentham, back issues of Tabs magazines or a dog-eared copy of the Strand catalogue. But along with a shiny new industry that makes lighting hardware 24/7 we now also have a number of good books on stage lighting. Many of the available works billed as ‘books on lighting’ may include some historical context but are primarily focused on the craft itself; manuals for the designing and doing of lighting. These books are invaluable for anyone hoping to understand the theories and techniques to be able to take their first steps in lighting a show. One area that is still to be more widely explored in the UK is the study of performance lighting in an academic way, particularly as subject education in lighting has developed through vocational courses. The curation of disciplinary knowledge currently resides with interested professionals, associations such as the ALD and ABTT and a small number of academics, many of whom formerly practiced in light. The problem with stage lighting manuals is they have limits when it comes to assisting the new wave of specialist scenographic and lighting students. In Light: … Scott Palmer, scholar and Lecturer in Scenography at the University of Leeds, offers a dedicated work that seeks to collate ideas and knowledge and present them together in order to provide a base textbook on the relationship between lighting and theatre so far. While craft still underpins much of the activity in lighting, Palmer’s book takes care to avoid being another stage lighting manual and presents the research and history un-technically. To see light in performance as more than a series of problems with technical solutions and to remove the grubbiness of ladders and cables etc. gives the reader a chance to consider the more intellectual side of our favourite subject. Unfortunately, Palgrave Macmillan give us filthy lampies a cover photo that includes some skips, two ladders, a fire bucket along with a brick wall, a roller shutter and a badly stretched gauze, if a reminder were needed that stage lighting is still seen by many as a blue collar business that has no place in scholarship. However, do not be put off by this as the photo does not represent Palmer’s way. The Readings In Theatre Practices series preface suggests a book about promoting ‘thinking about doing and thinking about materials’, in our case light, which in my view transcends mere material and is inadequately symbolised but the GLS stick lamp in the working lit stage of the book’s cover. On picking up this book, my advice would be to skip the cover and the series preface and instead go directly to Palmer’s intro which will guide you from there. The book is sectioned with easily deciphered titled chapters which hint at the deeper consideration within each including Light as Spectacle, Light and Space, Light and the Body, Light as Material and others. These sections give Palmer the freedom (and the difficulty as a writer) to bring together different elements of research and help the reader make sense of them. The book is thorough and well researched without being heavy going and the writer adopts a fairly light touch, offering to bring thoughts together for the reader but also leaving room for reflection. He also resists playing a game of Academic Buzzword Bingo with us and leaves much of the quoted passages and some sizeable interviews to speak for themselves. When he does get involved in summarising information external to the book itself, this is again done in a way that invites the reader to perhaps take their own journey through the history and those cited. In this manner, Light: Readings in Theatre Practice seems tailor-made for both students of light and their lecturers. The sections stand alone and can (and probably should) be dipped into, giving the lecturer a chapter to point a particular student toward, while the students themselves can quote from the book or better still discover the Appias, Craigs and Svobodas for themselves. Towards the end of the book the changing landscape of techniques, tools and even other stage lighting books are considered with the final chapter reserved for the Lighting Designer themselves. The latter part is an interesting transcription of Nick Hunt’s interview with LD Rick Fisher in a particularly candid mood, something to point all student lighting designers towards should they feel that 100% of lighting designs are wholly planned and executed according to that plan. The significant amount of spade work represented in Light: Readings In Theatre Practice should not be underestimated by the reader who might take the trouble to “Thank Palmer” every time they dip into this book in order to further their studies. The book is likely to be used as study map for lighting students as much as a text itself, which isn’t to diminish Palmer’s own input, but the various sources and ideas are the star turn. However, Light: … doesn’t just have a place in the educational library but instead should find room on the bookshelves of anyone interested in light in performance, filling that part of the shelf devoid of a comparable book or currently housing a box of black Sharpies. To understand a complex subject fully requires more than technical manuals and YouTube videos can provide and Palmer’s book is surely to be considered the first of it’s type as a subject-specific scholarly textbook on light in theatre. Now the practicing lampie can easily ‘backfill’ their understanding of Reinhardt after a hard day up the ladders stretching that gauze properly.